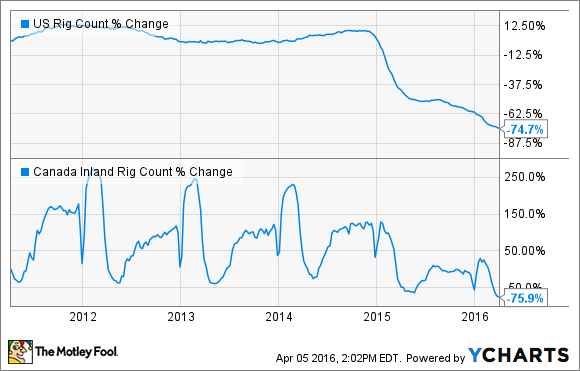 The decline of active rigs should lead to Precision's shares declining, but they shot up 30% in March instead. Image source: Precision Drilling investor presentation. What: Shares of Precision Drilling (NYSE:PDS) saw a robust gain of 30.8% in March, flying in the face of conventional wisdom that said the company should have declined as active rigs in the U.S. and Canada continue to drop and its credit rating was downgraded by Moody's. So what: You have to imagine that investors are looking for any sign of good news to send energy stocks higher. It looks as though they got it last month with oil and gas prices ticking up. Because, other than a bit of oil price relief, all signs pointed to Precision having a miserable month. For the 16th straight month, total active rigs in the U.S. and Canada have fallen, and the reduced capital budgets of producers don't suggest they are headed out to hire new rigs anytime soon. While the credit downgrade could sting the company in the future if there is need for financing, this is less of an issue today. It has more than $445 million of cash on hand, generated about $500 million in operational cash flow in 2015, and only has about $200 million in capital expenditures slated for 2016. As long as it stays the course, this credit downgrade is more of a bad headline rather than a fundamental game changer for the company. Now what: Precision drilling has some things going for it in comparison to its peers. Canadian drilling activity still remains seasonal because of harsh weather conditions, and the drilling season for Canadian producers is just getting started. At the same time, Precision is also looking to expand its footprint in the Middle East as it is bringing more rigs to Kuwait in 2017. Also, Precision's financial situation is in much better shape than that of some of its peers. At the same time, this past month's price spike seems a bit premature. Chances are, there are still several more months of low drilling activity across North America to go, and Wall Street's bullish stance today could go away pretty quick if oil and gas prices were to head down again. There is some value in Precision's shares today as the company is trading for about 80% of tangible book value, but looking longer term, there are companies in the rig space that have posted stronger returns over the long run that are also trading for cheap.